This week commemorates two years since the Rana Plaza factory collapse in Bangladesh. More than 1,000 people were killed and more than 2,500 injured in the accident, mostly CMT (cut, make and trim) garment workers. Only the day before, structural cracks were noticed in the building and the ground floor retail stores were closed. The garment factories on the upper floors were notified of the situation but they forced their workers to return to work the following day, and hours later the building collapsed. 90 per cent of clothing brands have no idea where their raw materials come from. The Rana Plaza disaster has started a worldwide movement to demand transparency from the companies that make our clothing. What information that's out there doesn't make for comfortable reading. Every step of the way is filled with stories of environmental or social exploitation. So, over the next few months I'm going to take a look inside my own wardrobe and I'll share the stories I come across in the process. I'm starting with a clothes audit that I'm only part way through, but already that is proving to be pretty surprising. 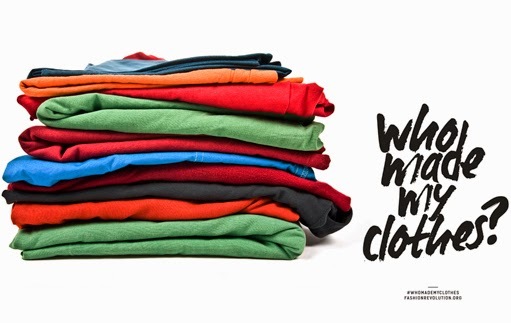 In the meantime, if you want to know where your clothes come from, join in the Fashion Revolution on April 24 by taking a photo of yourself wearing your favourite clothing label inside out, post it on social media, and ask the brand "who made my clothes?". 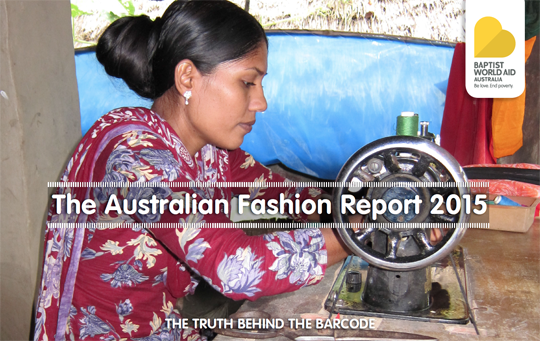 Or, for those in Australia, an organisation highlighting the issues around the Rana Plaza collapse is Baptist World Aid, who have just released their second report on the Australian fashion industry titled 'Behind the Barcode'. This report ranks each brand from A to F in terms of their traceability, monitoring and payment of living wages across the raw materials, textile production and cut/make/trim processes that go into their garments. Click on the image below to be taken to the report. And finally, if you want to do some wider reading on the issues surrounding our culture of fast fashion, I'd highly recommend Lucy Siegle's 'To Die For – Is Fashion Wearing out the World', which is a more UK-centric look at the situation, or 'Overdressed – The Shockingly High Cost of Cheap Fashion' by Elizabeth L. Cline, for US readers. Labels: Fashion Revolution, fast fashion, Rana Plaza, sustainability, who made my clothes? Oh thank you for this topic and for including links for readrrs in other parts. I wonder about the origin of beautiful quilting fabrics too. They're still being released in huge quantities at ever increasing rates, with little regard for the damage the cotton industry does! Great post, thanks for starting this series! Thanks, and you're welcome Mary.